by Captain Ron Larson, U.S.M.M., Ret. Paddlewheel steamboats on the upper Mississippi River played a major role in the development of the Midwest and Louisiana Territories 1800’s. The book starts off by covering the early French explorers and hardy fur trappers. It then goes into the history of the paddlewheel steamboats. 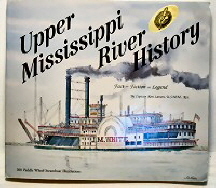 There are also photographs and early historical stories of upper Mississippi River towns.